I've had a couple of people ask me about which Wi-Fi settings work with Bunjalloo. That means there are probably more folk out there who haven't asked but are not sure either. So here's the lowdown. Bunjalloo will only work with unencrypted or WEP encrypted Wi-Fi settings. 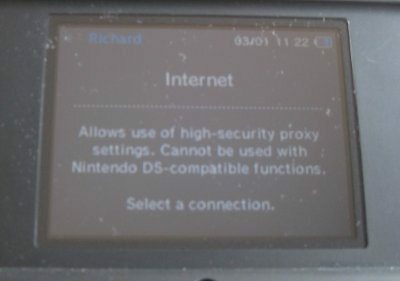 It does not work with the DSi Advanced Settings options (WPA), nor does it work with the Nintendo USB Wi-Fi Connection. These limitations are partly due to the dswifi library, which sgstair created by reverse engineering the original DS Wi-Fi hardware. It's remarkable that it works at all, let alone that it works so well while being easy to use. But the price of being unofficial is that it does not support all the hardware features that official titles do, notable it's missing support for the USB Wi-Fi device. 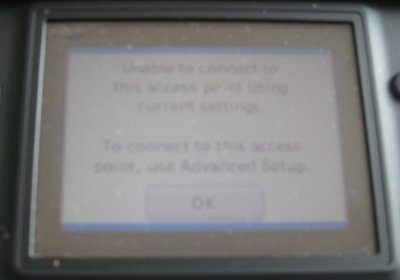 The lack of DSi/WPA support is simply because applications booted from the current generation of DS flash cards cannot access any DSi features at all, Wi-Fi or otherwise. As for the Nintendo USB Wi-Fi Connection... well, that's a bit of a white elephant really. The advantage is that you can use your network with WPA and still have your DS connect via the USB dongle that's plugged in to your regular PC. For me though having to turn on my PC to use the DS with Wi-Fi defeats the object of a low overhead, quick-to-boot-and-connect gizmo. The final straw is that the USB Wi-Fi program is only available for Windows. 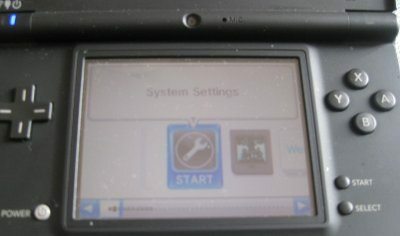 This is more or less the same deal as on a regular DS, but built in to the DSi's firmware. You don't need to start a game to alter the settings. Open access points show the signal strength and SSID name. 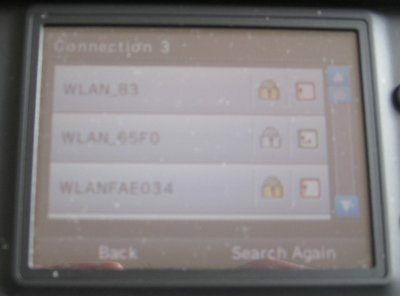 Encrypted connections also show a padlock icon. Gold padlocks are for WEP encrypted access points, which you can use with regular DS games (if you have the WEP keys). If the padlock is grey though, well that means the access point uses WPA encryption and you will only be able to connect using the DSi's "advanced settings". "Unable to connect to this access point using the current settings. To connect to this access point, use Advanced Setup"
"Allows use of high-security proxy settings. Cannot be used with Nintendo DS-compatible functions." In other words, you can't expect to use Mario Kart's online mode directly with your WPA protected network. 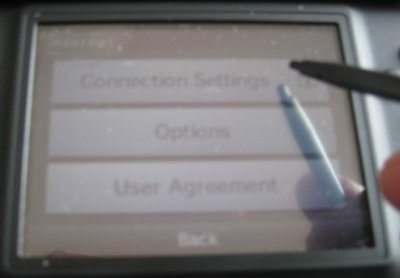 This type of connection will only work with the DSi's built-in browser, the Nintendo DSiWare store, and other DSi-only titles. So there you have it. 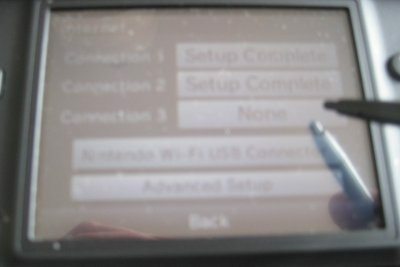 The DSi's WPA Wi-Fi settings are not backwards compatible with regular DS titles, so they cannot be used by homebrew applications either. If you want to use the DS to its full potential, you will have to run an access point with the security set to "dubious" (WEP). It'll probably be enough to stop your neighbours accidentally nicking your broadband, but won't keep determined Wi-Fi thieves out. The official help for all this can be found on the Nintendo Customer Service site. For enhanced security whilst using WEP, ensure you've got your router set up to provide access only to approved MAC addresses. That'll ensure that only network devices you've manually given access to will be able to use the wifi connection. Mac Address can be hacked easyly if you found the WEP key. 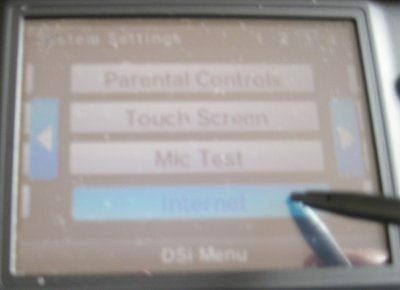 I have to use advanced settings for my dsi... does wifi nnot work with advanced settings? Make sure that you only get the most updated firmware when buying r4i cards. It is good to check online sited that offers deals before actually closing a deal.